Maryland Chess Directory. If your club is not listed or not up to date please contact us using the link under site index. If you have any chess news share this with us too. Chess is probably one of the oldest and most famous games in the world. It is believed to have originated from India as early as the seventh century, although the exact origins of chess are unknown. Chess has appeared in many shapes and forms. Today most people play what is known as Europeans chess. Chess is a universal game - universal in the sense that it is accepted and played in every country and culture. There are many tournaments held worldwide and many more in each individual country. The basic rules of chess are simple, however to be able to play strategically and master tactics requires skill and dedication. In its modern form the game consists of an eight by eight board of alternating black and white squares and chess pieces. Each player has sixteen different pieces, which are used to play the game with. A player starts off with a king, a queen, eight pawns, and two each of bishops, knights and rooks. The aim of the game is to corner and immobilize the opponent's king so he cannot make any further moves. Modern chess is also known as the 'queens chess' as the queen is the piece with the most power. It can move any number of squares in any direction, given there is enough space to maneuver. All pieces move in straight or diagonal lines with the exception of knights. A knight's movements are similar to the shape of the letter 'L'. When the opponent's king piece has been immobilized it is known as "checkmate". Chess has many benefits and it is now being taught in many schools over the world to children from a young age. It has many academic benefits and improves ones ability and skill. Chess improves a child's thinking ability by teaching many skills. These include the ability to focus, plan tasks ahead, thinking analytically, abstractly and strategically and consider all the options before making a move. They also improve one's social and communication skills by playing against another human player. 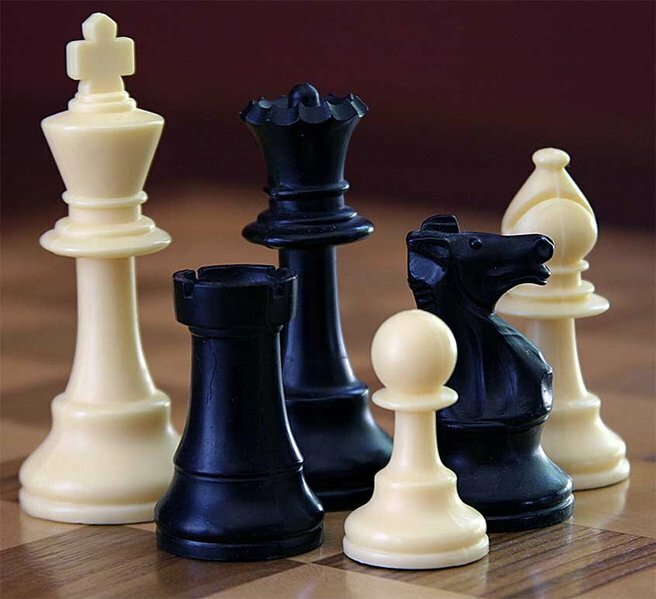 Research has shown that kids that play chess regularly have a significant improvement in their math and reading ability. Nowadays chess can be played pretty much anywhere. All you need is the board and pieces and somebody to play against. If you cannot find another person to challenge then there are plenty of computerized versions of chess. The software comes in many different versions such as 2D or 3D and with nice animated effects or just as a plain board and pieces. It is possible to play against a computer player and up the difficulty level if required. With the advent of the Internet it is now easily possible to search for many other players online whom to play against. Garry Kasparov is one of the world's most famous chess players. He is a chess grandmaster and one of the strongest chess players in history. He has the highest ranking on the FIDE listing. Ranked first in the world for nearly all of the 20 years from 1985 to 2005, Kasparov was the last undisputed World Chess Champion from 1985 until 1993; and continued to be "classical" World Chess Champion until his defeat by Vladimir Kramnik in 2000. In February 1996, IBM's chess computer Deep Blue defeated Kasparov in one game using normal time controls, in Deep Blue - Kasparov, 1996, Game 1. However, Kasparov retorted with 3 wins and 2 draws, soundly winning the match. In May 1997, an updated version of Deep Blue defeated Kasparov in a highly publicized six-game match. This was the first time a computer had ever defeated a world champion in match play. An award-winning documentary film was made about this famous match up entitled Game Over: Kasparov and the Machine. BALTIMORE. U OF MD - UMBC CHESS CLUB. Affiliate Type: College. FRI 4-6PM. UNIV CTR ROOM 310 , 1000 HILLTOP CIR . Contact: DR ALAN SHERMAN. (410) 455 - 2666. BALTIMORE. THE BISHOPS OF ST JAMES CC. Affiliate Type: Regular. Contact: C/O NANCY BARRICK. BALTIMORE. HUBER'S KNIGHTS OF VALOR. Affiliate Type: Regular. 1ST/3RD SAT 9:30AM-12. Contact: BR KEN TABRON. (410) 367 - 0003. email: abreaud@bellatlantic.net. BALTIMORE. BLACK & WHITE CHESS CLUB. Affiliate Type: Regular. 7 DAYS 11AM-11PM. BLACK AND WHITE CHESS SHOP , 1717 ALICEANNA ST , BALTIMORE, MD . Contact: DAMON NORKO. (410) 534 - 5747. email: redsnorko@aol.com. BALTIMORE. DIGITAL HARBOR HS 416 CC. Affiliate Type: Scholastic. Contact: C/O LAURI WILSON. BALTIMORE. GRANGE ELEM CHESS CLUB. Affiliate Type: Scholastic. TUES/THUR 3:30-4:30PM. GRANGE ELEM LIBRARY , 2000 CHURCH RD . Contact: ELAINE LANTZ. (410) 887 - 7043. BALTIMORE. ROSEDALE ALT MIDDLE SCHOOL. Affiliate Type: Scholastic. Contact: CHESS CLUB / DAVID SHAEFER. BETHESDA. ST BARTHOLOMEW CATHOLIC SCHOOL. Affiliate Type: Scholastic. Contact: CHESS CLUB / MARLA R WOLFE. CHESTERTOWN. KENT SCHOLASTIC CHESS. Affiliate Type: Scholastic. WED 3:45-5:15. CHESTERTOWN MID SCHOOL , CHESTERTOWN MD 21620 . Contact: MICHAEL HARVEY. (410) 810 - 3890. COCKEYSVILLE. COCKEYSVILLE MIDDLE SCH. Affiliate Type: Scholastic. TUES 2:45-4 PM. SAME . Contact: C/O GLENN SEGAL. (410) 887 - 7626. COLUMBIA. HOWARD COUNTY CHESS CLUB. Affiliate Type: Regular. TUES 7-10PM. BUNPENNY CAFE , COLUMBIA MALL . Contact: WILLIAM WALKER. (410) 730 - 8958. email: walkerfam@erols.com. COLUMBIA. PRIMORYE RATED CHESS EVENTS. Affiliate Type: Regular. rjkavall@bestchess.net. Contact: ROBIN KAVALL. (410) 531 - 3840. DARNSTOWN. MARY OF NAZARETH SCH CC. Affiliate Type: Scholastic. Contact: C/O NANCY LISLE. FORESTVILLE. CHESS ACADEMY. Affiliate Type: Regular. Contact: C/O THEODORE FAGAN. FREDERICK. GOV THOMAS JOHNSON MID SCHOOL. Affiliate Type: Scholastic. WED 3:15-4:15. SCHOOL . Contact: FRANK JULIA. (240) 236 - 4900. FT WASHINGTON. ISSACC GOURDINE MS CHESS CLUB. Affiliate Type: Scholastic. Contact: C/O WOODROW TOWNSEND. GAITHERSBURG. CHESS AND GO CLUB AT. Affiliate Type: Regular. Contact: LAKE FOREST MALL / O PANCOAST. GAITHERSBURG. C&O FAMILY CHESS CENTER. Affiliate Type: Scholastic. M-F 6-9:30PM, SAT/SUN NOON-5PM. LAKEFOREST MALL (FOOD COURT) , WED 6-8PM AT DREAM WIZARDS , GAME STORE, ROCKVILLE, MD . Contact: OMAR PANCOAST III. (301) 963 - 9122. email: OPancoast3@aol.com. This club offers: Lessons , Beginners Welcomed Additional Information: Specialize in beginner & intermediate instruction for children and adults, as well as parent and teacher training. We sponsor occasional small tournaments, usually at the Dream Wizards site. GARRET PARK. HOLY CROSS ELEM SCHOOL. Affiliate Type: Scholastic. TUESDAYS 3-5 PM. SCHOOL HALL . Contact: MARY MORIARITY. (301) 949 - 0053. HARWOOD. ANNAPOLIS CHESS CLUB. Affiliate Type: Regular. TUES 6:30-11PM. BARNES NOBLE BOOKSTORE , 2516 SOLOMONS ISLAND RD RT 2 , ANNAPOLIS,MD 21401 . Contact: JAMES BECKER. (301) 261 - 9650. LUTHERVILLE. HAMPTON ELEM SCHL CC. Affiliate Type: Scholastic. Contact: C/O LISA SELBIE. (410) 825 - 4665. NEW WINDSOR. FREDERICK COUNTY CHESS CLUB. Affiliate Type: Regular. FRIDAY 6:30-9:30. NORTH FREDERICK ELEM SCHOOL , 1000 MOHER AVE , FREDERICK,MD . Contact: C/O WILLIAM MC ENTEE. (410) 875 - 2460. NEWBURG. DR THOMAS L HIGDON ELEM SCHL. Affiliate Type: Scholastic. TUESDAYS 8-9 AM. SCHOOL . Contact: CHESS CLUB C/O KEVIN RITTER. (301) 934 - 4091. NEWBURG. PICCOWAXEN MIDDLE SCH CHESS CL. Affiliate Type: Scholastic. Contact: C/O AMANDA O'NEILL. NORTH EAST. NORTH EAST MIDDLE SCHOOL. Affiliate Type: Scholastic. FRIDAYS 3-5PM. SAME AS MAILING ADDRESS . Contact: AARON BETHARD. (410) 996 - 6210. OWINGS MILLS. LIBERTY CHRISTIAN SCH CHESS CL. Affiliate Type: Scholastic. Contact: C/O RIK BAIR. OXON HILL. JOHN HANSON MONTESSORI SCHOOL. Affiliate Type: Scholastic. Contact: CHESS CLUB / TIA BRECKENRIDGE. PASADENA. BODKIN CHESS CLUB. Affiliate Type: Scholastic. 1ST/3RD WED OF EACH MONTH. BODKIN ELEM SCHOOL . Contact: VICKI LINES. (410) 437 - 0464. POTOMAC. COLD SPRING ELEMENTARY. Affiliate Type: Scholastic. MON 3:30-5PM. COLD SPRING ES , 9201 FALLS CHAPEL WAY . Contact: MITCHELL SHAPIRO. (301) 951 - 8696. REISTERSTOWN. CHECKMATE CHESS LEARNING CTR. Affiliate Type: Regular. Contact: C/O GENNADY MILYAVSKY. REISTERSTOWN. CATONSVILLE CC. Affiliate Type: Regular. FRIDAYS 7:30PM-12:00PM. CATONSVILLE SR CTR , 501 N ROLLING RD , CATONSVILLE MD 21228 . Contact: DAN ELLIOTT. (410) 526 - 3504. ROCKVILLE. MONTGOMERY CHESS. Affiliate Type: Regular. Contact: C/O THOMAS RICHMOND. (301) 933 - 4171. SALIBURY. SALISBURY CHESS CLUB. Affiliate Type: Regular. WED 7-11 PM. SALISBURY UNIVERSITY , DOGWOOD AVE , SALISBURY, MD . Contact: KEN MILUTIN. (410) 548 - 7933. SALISBURY. GLEN AVE SCHOOL. Affiliate Type: Scholastic. Contact: C/O CURTIS TWILLEY. SEVERN PARK. SEVERN SCHOOL. Affiliate Type: Scholastic. 2:30-3:30 THUES/THURS. SEVERN SCHOOL . Contact: TOM MC NAMARA. (410) 647 - 7700. SILVER SPRING. UNIVERSITY OF MARYLAND CC. Affiliate Type: College. FRI 2-8:00 PM. STUDENT UNION RM 1104 . Contact: SCOTT CARLSON. (301) 649 - 1272. STEVENSVILLE. BAYSIDE CHESS CLUB. Affiliate Type: Regular. Contact: JANE BEERS. (410) 643 - 6181. STEVENSVILLE. STEVENSVILLE MIDDLE SCHOOL. Affiliate Type: Scholastic. Contact: CHESS CLUB C/O JEN THOMAS. STEVENSVILLE. KENT ISLAND HIGH SCHOOL. Affiliate Type: Scholastic. Contact: DEBBIE HARDY. (410) 604 - 2070. STEVENSVILLE. LIGHTHOUSE CHRISTIAN ACADEMY. Affiliate Type: Scholastic. Contact: CHESS CLUB / JENNIFER VARNEY. TOWSON. LOCH RAVEN CHESS CLUB. Affiliate Type: Regular. THURSDAY 6:30-9:30. LOCH RAVEN COMMUNITY CENTER , 1801 GLEN KEITH BLVD , TOWSON, MD 21286 . Contact: JOSEPH SCHATZ. (410) 828 - 1827. WESTOVER. EASTERN CORR INST W CC. Affiliate Type: Prison. SAT 10 AM/SUN 2 PM. SAME . Contact: C/O JANE ROLLINS VAC III. (410) 651 - 9000. WHITE PLAIN. TRI COUNTY CHESS CORNER. Affiliate Type: Regular. Contact: FELIX CUMMINGS. (301) 870 - 7318. WOODLAWN. BALTIMORE CO POLICE ATH LEA. Affiliate Type: Regular. 3-8 PM. PAL , 7111 CROYDEN RD . Contact: LEROY STANTON. (410) 887 - 6806. WOODSTOCK. WAVERLY ELEMENTARY CC. Affiliate Type: Scholastic. 2 TIMES A MONTH AFTER SCHOOL. WAVERLY ELEM SCHOOL . Contact: BRIAN JOLLES. (410) 465 - 6868.